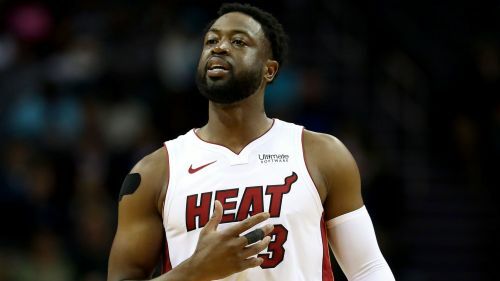 The Miami Heat are well-placed to make the playoffs in Dwyane Wade's final NBA season after a win over the Charlotte Hornets on Wednesday. With Miami's 91-84 win, the Heat have moved into the eighth playoff spot in the Eastern Conference. Kelly Olynyk's 22 points and 11 rebounds and Hassan Whiteside's 18 and 15 off the bench helped the Heat grab the win. Kemba Walker and Frank Kaminsky each had 20 for Charlotte. In Los Angeles, LeBron James moved in front of Michael Jordan and into fourth place on the all-time scoring list. James passed Jordan with a layup in the second quarter of the Lakers' game against the Denver Nuggets. It was the Lakers star's 32,293rd and 32,294th career points. It took James 1,190 games to reach that mark while Jordan needed 1,072. Mavericks rookie Luka Doncic had 31 points, 11 rebounds and seven assists but Dallas fell to the Washington Wizards 132-123. Bradley Beal had 30 points, eight assists and seven rebounds in the win. Detroit Pistons center Andre Drummond had 31 points and 15 rebounds in a 131-114 win over the Minnesota Timberwolves. LaMarcus Aldridge had 31 points and nine rebounds in the San Antonio Spurs' 111-104 win over the Atlanta Hawks. Kevin Love looks healthy as he scored 24 points and added 16 rebounds, but the Cleveland Cavaliers fell to the Brooklyn Nets 113-107. The Pistons' Blake Griffin has been great this season but he was not at his best as he scored just nine points on four-of-13 shooting. The nine points is his lowest output since he tallied six in a win over the Hawks on November 9. Zach LaVine scored 39 points while adding five rebounds and four assists. But, it was his layup with 1.5 seconds left that fans will remember because it gave the Chicago Bulls a 108-107 victory over the Philadelphia 76ers. Everyone counted the Indiana Pacers out when Victor Oladipo went down for the season with an injury, but this team have just kept on winning as they have gone 10-8 without him and remain in third place in the Eastern Conference. They are 10-4 in their last 14 games. The Milwaukee Bucks, though, have an MVP candidate – Giannis Antetokounmpo – and the best team (record-wise) in all of the NBA. LeBron passes Jordan: Who is the GOAT? LeBron passes Jordan: Who's above James in the all-time points list? Michael Jordan or LeBron James?